A beautifully written and produced early "chapter book" by a well-known British novelist--strong on style but weak on content. 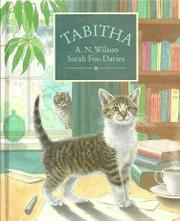 The events in Tabitha's life are ordinary and without much drama, although considerable humor is derived from her point of view as a kitten who misinterprets the behavior of the "two-footers" (people)--e.g., "they had squealed with excitement when Tabitha showed them how to eat a raw lamb chop." She spends some days stalking the other kitten that appears in mirrors; saves a dimwitted guinea pig from another cat; and eventually produces kittens of her own. Fox-Davies' full color illustrations--many beautifully composed full pages plus frequent, charming vignettes--are outstanding for their humor, precise observation, and carefully detailed execution. A satisfying read-aloud or young reader for animal lovers.